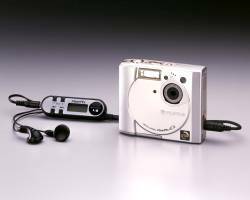 Talk about media convergence - the FujiFilm 40i squeezes both a hi-res digital camera and an MP3 player into a palm-sized package. If it weren't for this camera's solid features and outstanding resolution, the combination could have come across as a forced gimmick. But, the 40i works hard not to short-change either of its functions. The camera offers hefty 2.4 megapixels of resolution (interpolated up to 4.3 megapixels!) and all the features you'd expect like manual/auto exposure modes, built-in flash, the ability to take short video clips (with audio), etc. But, the MP3 features aren't just tacked on. The 40i includes headphones, a tethered remote for controlling MP3 playback and provides audio mixing settings to match your eardrums' tastes. A compact implementation of a cool idea, the FujiFilm FinePix 40i is a digital camera that begs to be carried even when you aren't taking pictures.